Siran Stacy was one of the heralded runningbacks out of the University of Alabama for the Crimson Tide, rushing for 2113 yards and 27 touchdowns over his career. He was also an able bodied receiver making 62 receptions. The Eagles would draft Siran Stacy in 1992 in the second round of the draft, but after one season with the team when he played in no games he’d be on the street after being charged with assault. The Eagles wanted no part of this. He signed with the Cleveland Browns the following season, but after being arrested for simple theft, the Browns cut him. This would be the first wake up call for Siran as he would be without football through 1995. With the return of the WLAF now in the form of the newly retooled NFLE (National Football League Europe), Siran Stacy would see a chance to redeem his professional football career. Drafted by the Scottish Claymores and their run based offense, Stacy would set new official marks for the league in rushing running wild for 785 yards and 5 touchdowns for the Claymores in 1995. He’d return to play for the team again in 1996, almost duplicating his numbers, (running for 780 yards and 3 touchdowns,) and for the hat trick in 1997, he’d run again for… 785 yards and 4 touchdowns! Stacy led his team to the World Bowl and was named the league’s MVP in 1997. He’d retire in 1998, but play one final season in the NFLE and briefly for the Saskatchewan Roughriders of the CFL in 2000. Stacy is the career leading rusher of the Scottish Claymore franchise and the NFLE with 2362 yards. After retirement, Stacy went into corporate banking and became involved with the FCA, but in 2007 tragedy struck Siran’s life as his wife, 3 daughters and a son were killed in a collision with a drunk driver. This would lead Stacy to another rebirth, as he started his own ministry and became closer to Christ. 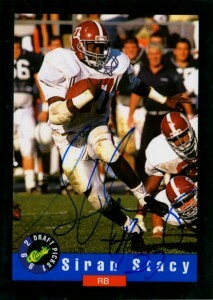 He currently runs Siran Stacy Ministries, to which you can visit his website at siranstacy.org. In 2008 he was named the honorary captain of the Iron Bowl between Alabama and Auburn.